Teacup with saucer. 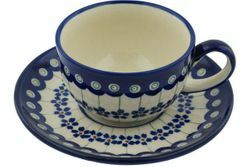 Our Polish pottery teacup & saucer is the perfect compliment for your new teapot. Hand-painted Polish pottery stoneware holds both heat and cold for extended periods. The superior quality of Polish stoneware makes this teacup perfect for every day use.